At 0900 EST, with an east-northeast 29-knot breeze gusting to 35 knots and a prediction for more of the same over the course of the afternoon, organizers of the 85th BACARDI Cup cancelled the day’s scheduled race for the 67 registered Star teams. Headlining BACARDI Miami Sailing Week (BMSW) presented by EFG Bank, the Stars will race alone through Thursday, March 8, after which they will be joined by the Viper 640, Audi Melges 20, Melges 24 and J/80 classes. Racing will conclude for all classes on Saturday, March 10. Today’s unplanned respite from racing allowed competitors to enjoy the hospitality lounge and BACARDI Rum tastings, along with the exhibitions of Rhode Island-based award-winning nautical photographer Onne van der Wal and “150 Years of BACARDI,” a collection of information, photos and artifacts from the BACARDI museum. The exhibits are located in the North Hall of the Coconut Grove Convention Center and are open to the public free of charge from noon to 7:00 p.m. daily. The prestigious Coral Reef Yacht Club is coordinating on-water activities in collaboration with Biscayne Bay Yacht Club and Coconut Grove Sailing Club. The U.S. Sailing Center and Shake-A-Leg Miami are also supporting the event. 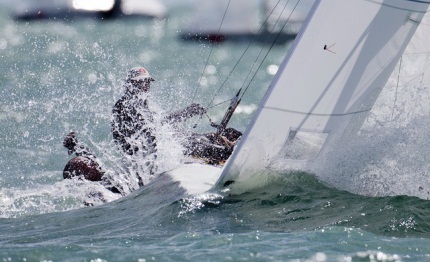 Full results, photos and additional information on the 85th BACARDI Cup and BACARDI Miami Sailing Week are available at www.MiamiSailingWeek.com and www.BacardiCup.com.